No matter how healthy a child may eat, almost every mom wishes that her child ate more greens. 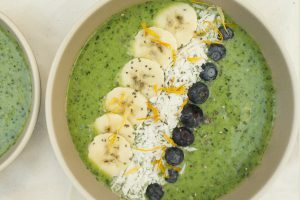 Most green smoothies are delicious— but when you break it down, you find that the only vegetable in a green smoothie is spinach or kale. While both are great for you, they’re typically overpowered by a load of fruit in them. This is why I designed a green smoothie recipe with Yumi’s mission in mind: nutrient-dense and low in sugar. In this smoothie recipe, you can pick your greens. Spinach is high in vitamins A, C and K, iron, potassium, manganese and others. Kale is also high in vitamins A, C and K, as well as calcium and potassium. Feel free to choose whichever green you like based on what you have on hand in the fridge. Now, let’s talk MORE veggies. To lower the sugar in this smoothie and increase the nutrient density, I’ve added cauliflower that’s been steamed and frozen. The flavor is subtle (aka you won’t taste it mixed up in a smoothie), and it’s a great way to decrease sugar levels. Cauliflower is high in fiber, vitamin C, vitamin K, vitamin B6, folate, pantothenic acid, potassium, and manganese— it’s a vitamin feast. Making it for yourself? Get creative with your toppings. The more nutrients, the merrier. On to the fruit— banana is the perfect natural sweetener and adds an extra dose of fiber and potassium. Kiwi (a Yumi favorite) is packed with vitamin C and vitamin K, as well as fiber, vitamin E, potassium, and copper. If you don’t have any kiwis on hand, feel free to add in some frozen mango or whatever other fresh or frozen fruit you have in your stockpile. For the liquid in this smoothie, I use unsweetened almond milk, which provides you with calcium and vitamin A. For an extra boost of protein, you can use protein-fortified almond milk. Lastly— spirulina. Spirulina is water-grown, 100% vegetable plankton. It provides more chlorophyll than any other food source in the world, which offers increased energy, stamina, attention, focus, and mental clarity. It also helps to promote a healthy immune system, nervous system, brain and digestive tract, as well as a balanced metabolism. 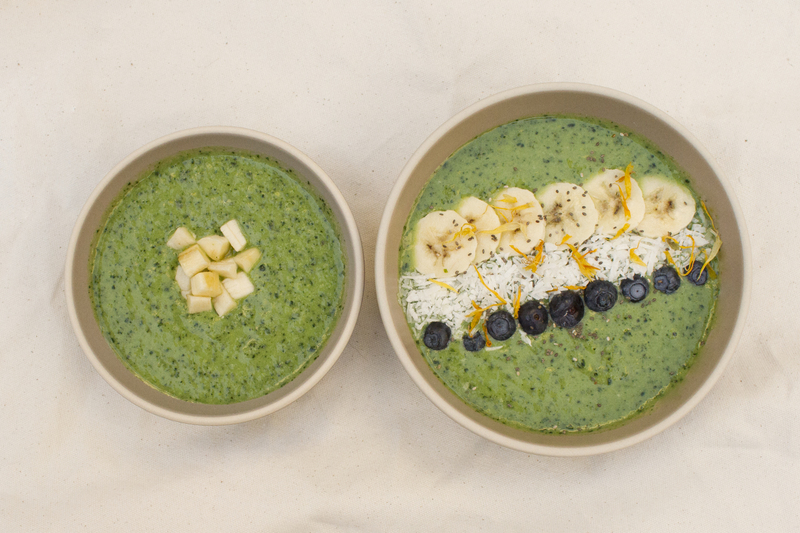 Make sure to only add a 1/4 teaspoon though— spirulina powder is super concentrated! Finally, a green smoothie that has just the right amount of fruit. In a large blender, combine all of the ingredients listed above and blend until well-combined. Separate into dishes for yourself and for baby. Top off the smoothies with toppings, if desired.